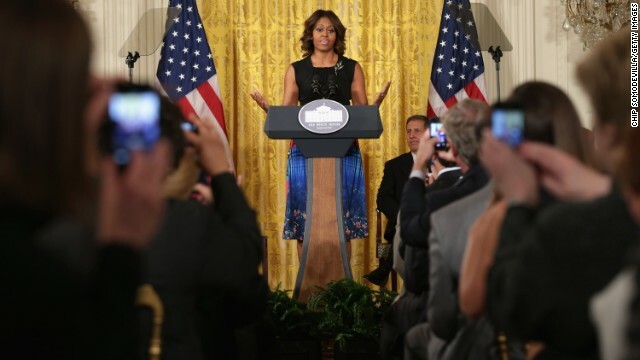 Washington (CNN) - First lady Michelle Obama announced a new initiative at the White House on Wednesday to help end veteran homelessness across the country by the end of 2015. The Mayors Challenge to End Veteran Homelessness is a call to action for mayors and other state and local leaders across the country to make a commitment to make sure all veterans in their communities have a roof over their heads. "So just like it's our country's duty to bring back all of our men and women from the battlefield, we've also got a duty to make sure that every single veteran has a place to call home when they get here and for the rest of their lives," said Obama. Joined by acting Veterans Affairs Secretary Sloan Gibson and Housing and Urban Development Secretary Shaun Donovan, the first lady announced the commitment of 77 mayors, 4 governors and 4 county officials already onboard to help meet that goal. "These leaders are best equipped to tackle this challenge because they know their communities inside and out. They are in touch with service providers who know these veterans by name," the first lady said. "They aren't just going to address veteran homelessness in their cities and states, they are going to end it." Obama urged more leaders to get involved and played on the competitive nature of the country's mayors. "I want to know if more mayors can challenge each other on this issue," Obama pushed. "Can you challenge a neighboring mayor or governor to see who can get all their vets into housing first?" Homelessness among veterans has declined each year since 2010 but there were still nearly 58,000 homeless veterans in the United States at the start of 2013 accounting for just over 12 percent of all homeless adults, according to the Department of Housing and Urban Development. The first lady noted that of the total veteran population, the percentage who are homeless only reaches 0.3 percent but even that was too high. "Even one homeless veteran is a shame. And the fact that we have 58,000 is a moral outrage," said Obama. "Tens of thousands of veterans who risked their lives for our country are sleeping in their cars, or in a shelter, or next to a subway vent." Obama continued. "We should be horrified because that is not who we are as Americans." Veteran Chris Fuentes, who introduced the first lady, found herself living in her car after returning from serving in Iraq and finding her job gone. Her baby girl had to live with Fuentes' mother as Fuentes searched for some stability. She said she received word from another veteran of the programs provided by the VA that helped her get settled in a new home and reunite with her daughter. "These programs give veterans a second chance at life and allows them the opportunity to not worry about where they might have to lay their head at night," said Fuentes. This announcement comes at a time when both the VA and the White House have been under fire for allegations of mishandling the VA medical care system leading to the department's secretary, Eric Shinseki, to resign last week. Acting VA Secretary Gibson pointed out that improving veteran care was another "priority goal" of the VA alongside ending veteran homelessness. "As the President has directed, we are moving immediately to getting veterans off of wait lists and into clinics and we are taking actions to fix the systemic problems that allowed these unacceptable waits to occur." 6 out of 10 americans don't trust this president period. the topic is irrelevant. What sphincter did you pull that poll out of? Hannity's? Why not use the $ millions that Barack spends on the FDA to educate illegal immigrants on how to get US Food Stamps after they illegally cross the border? Our troops deserve help. OK Biff, did you read the article before you knee jerked your hatred? The First Lady WANTS TO HELP! CONGRESS WITHHOLDS FUNDING TO THE VETERANS ADMINISTRATION. Oh, and the POTUS is educating illegals to get Food Stamps? I guess the desperate GOP tactic is to make up crap, throw it on the wall and hope it sticks? What?? Who believes this family anymore? Is everyone brain dead? WAKE UP AMERICA! ok....sounds wonderful. what are the details? where is the beef? what is the plan to achieve this? free housing? subsidized houring? does the tooth fairy give them homes? I thought Obamas already had plan for veteran homelessness......just let them die waiting to get care...is this some new plan now? After Barry's wasting billions of our taxpayer money making sure millions of illegals have free housing, medical, food, school and jobs that pay under the table, it's nice he and his sidekick want to throw a bone to our homeless Veterans. Sure because ALL of the problems at the VA started on January 20, 2009. Actually they are the cause of all the country's problems. Prior to then everything was perfect. Everyone had great jobs, there was no recession and Lil Bush was a freekin' genius. It's a damn shame no matter what this couple tries to do, Fox and it's PWT followers vilify them. That's right Abbey – it's entirely President Obama's fault the VA has been a mess for decades. Yeah. This country is done with these people living in our White House. All of this is just jingling keys to divert attention from the continued lawlessness of this family. -so according to you every one trusts GOP garbage?